For years, archaeologists have been using LIDAR to study ancient Maya sites. 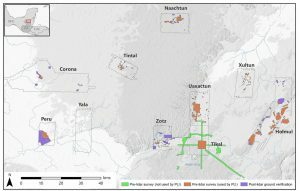 Recently, an analysis was released of a 2016 survey of the Maya lowlands. The survey, the largest ever done in the region, covered 2,144 square kilometers of land and uncovered a total of 61,480 ancient man-made structures (Canuto et. al 2018). Although the population density was clearly not homogenous – some areas were very rural while others were were far more urban – the researchers estimate an average population density of about 120 people per square kilometer, or about 7 to 11 million people total (Canuto et. al 2018). According to Dr. Thomas Garrison, one of the archaeologists involved with analyzing the data, this discovery is revolutionary because it places population estimates in this region at several times more than was previously thought and reveals new information about the politics, economics, and agricultural practices of the area (St. Fleur 2018). A map of the surveyed regions. As one might expect, a significant amount of farmland was needed to produce food for such a large population, and this could be found right there in the lowlands (Canuto et. al 2018). According to archaeologist Francisco Estrada-Belli, “All of these hundreds of square kilometers of what we thought were unusable swamp were actually some of the most productive farmland” (St. Fleur 2018). The urban areas would have relied on the rural ones for importing food, since the LIDAR scans show that there was not enough farmland immediately surrounding most of them to support their populations. In fact, the many kilometers of roadways imply a high level of interconnectedness between much of the surveyed area, while the infrastructure layout and connectivity more generally reveals that there was likely large-scale planning done by a centralized power (Canuto et. al 2018). Some of the LIDAR rendering, showing several houses and other structures. 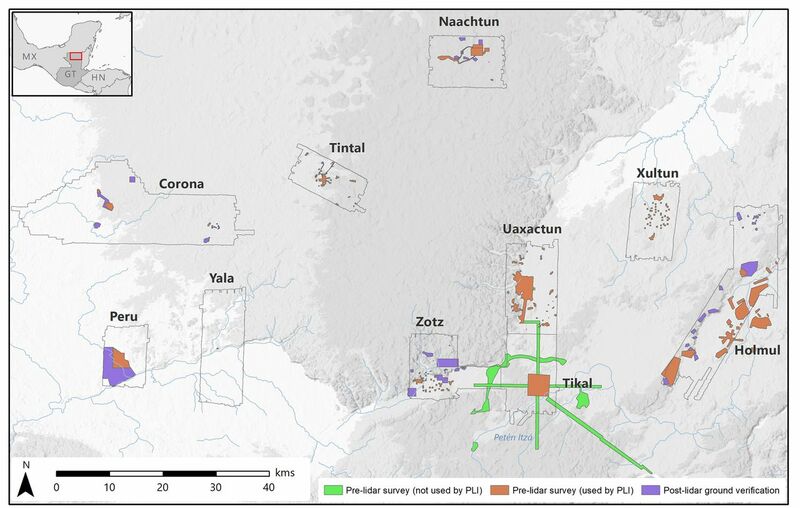 This LIDAR survey reveals important information about the farming practices of the Maya as well as about the extensive infrastructure and organization of their societies. The intensive farming itself is not an isolated thing, since it is known that Mayan agricultural practices and urban expansion had significant impacts on the land (Stromberg 2012). But what is surprising is the location and extent of the land modification. This study will help archaeologists and historians better understand the Maya lowlands, and develop a better image of what their societies look like, and possibly even why they fell. Since our modern societies are facing increasing environmental crises (also partially from unsustainable farming practices) it is more important than ever to learn from the past to change the future. 2018 Ancient Maya Lowland Complexity as Revealed by Airborne Laser Scanning of Northern Guatemala. Science Magazine, accessed 1 November 2018. 2018 Hidden Kingdoms of the Ancient Maya Revealed in a 3D Laser Map. The New York Times, accessed 1 November 2018. 2012 Why did the Mayan Civilization Collapse? A New Study Points to Deforestation and Climate Change. Smithsonian Magazine, accessed 3 November 2018. 2018 The New York Times, September 27, 2018, https://static01.nyt.com/images/2018/10/02/science/28TB-MAYA/28TB-MAYA-jumbo-v2.jpg?quality=90&auto=webp , accessed 3 November 2018. 2018 Science Magazine, September 2018, http://science.sciencemag.org/content/sci/361/6409/eaau0137/F4.large.jpg , accessed 3 November 2018. The small town of Ipplepen is located in the southwest corner of England, in South Devon. As of 2011, Ipplepen is a small town with fewer than 3000 residents. Although it has such a small population, the area has a very long history, with settlements stretching back to the Iron Age. Since 2010, archaeologists from the University of Exeter and the British Museum have been excavating the sites, which in total span 1200 years of history. Recently, a team has excavated several locations containing garbage from the end of the Roman era. Analysis of the recovered artifacts has allowed researchers to piece together elements of the residents’ lives, such as their diet. In the garbage piles, animal bones have been preserved for thousands of years. According to the lead archaeologist on the team, Stephen Rippon, these animal can be used “to reconstruct past patterns of farming…Some of the bones that have been found have cut marks from when they were butchered.” The age of the animals when they were butchered gives information about local farming practices. For example, lambs would have been killed for meat, whereas older sheep would have been kept around for milk and wool. Through reconstructing the diets and farming practices of Roman-Age South Devon residents, researchers are able to better understand the area’s history. Archaeologists excavating at Ipplepen in 2016. The garbage has also provided clues into the financial status of the town. Among the artifacts recovered are some pieces of ancient pottery. Some of it is amphora, a type of pottery used to carry olive oil and wine made in the Mediterranean. Elsewhere at the site, a piece of an expensive cup was discovered. The style of the cup suggests that it was originally made in southeast England, and likely would have been someone’s valuable possession (until it broke). Residents were not, then, just poor farmers, as one might be inclined to think. Instead, these artifacts suggest that at least some of the residents were well-off, since they could afford Mediterranean wine and expensive pottery. 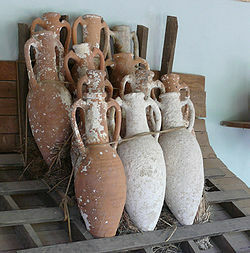 Some examples of amphora vases, used to hold wine and olive oil. 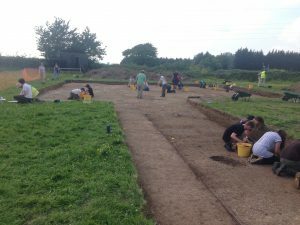 Throughout the Ipplepen excavation, researches have made a number interesting discoveries about the history of South Devon. Among those are a Roman road that once ran through the area, a graveyard from medieval times, and roundhouses from the end of the Iron Age. But trash tells a different, less obvious story than these structures do; it tells us about the day-to-day things that people did that they didn’t view as remarkable, such as eating meat and drinking wine. However, to an archaeologist, these discoveries provide valuable information about the living habits and status of a people or a settlement, such as in South Devon. 2017 “Rare Archeological Find Could Be the First Time Unique Pottery Seen in the Southwest.” Archaeology & Fossils, Phys.org. Electronic Document, June 28, 2017, https://phys.org/news/2017-06-rare-archaeological-unique-pottery-south.html, accessed 13 September 2018. 2018 “Ancient Household Waste Gives More Clues About Devon’s Roman History.” Research News, University of Exeter. Electronic Document, September 5, 2018, http://www.exeter.ac.uk/news/research/title_679888_en.html, accessed 12 September 2018. 2016 “2016 Excavation Day 2.” Ipplepen Archaeological Project (blog), June 8, 2016, http://ipplepen.exeter.ac.uk/2016/06/2016-excavation-day-2-7th-june/, accessed September 15, 2018. 2018 “Amphora.” Wikipedia, https://en.wikipedia.org/wiki/Amphora, accessed September 15, 2018.